On last week’s blog we revealed the dining room from our ‘South Austin Modern Farmhouse’ project. The dining room mixed neutrals and textures for a warm, inviting aesthetic. Our client’s also wanted their main living room, which opened up to the kitchen and dining room, to have that consistent cozy, interesting feel. The living room felt builder-grade and lacked any custom charm or special elements. A custom built-in with fresh and modern lines transformed the space into something much more memorable. In the living room, a pair of linen tufted sofas flank a weathered coffee table. These pieces help soften the modern space with classic farmhouse elements. Plenty of grey and white pillows keep the sofas cozy and neutral. Charcoal printed draperies frame the modern steel framed doors. The vintage inspired furnishings allow the crisp white built-in to be the major focal point of the space. 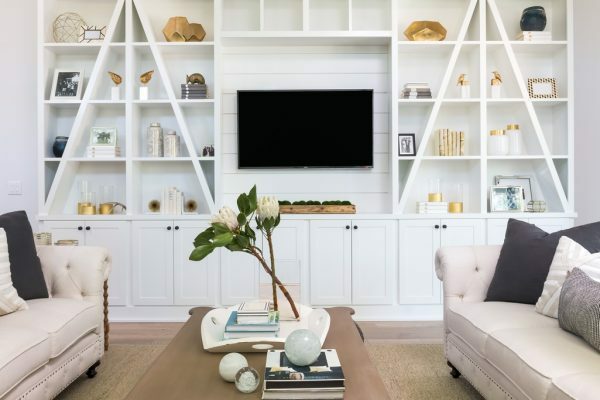 The shiplap detail behind the TV brings in another classic farmhouse touch to the living room, while the angular lines make the space feel fresh and modern. 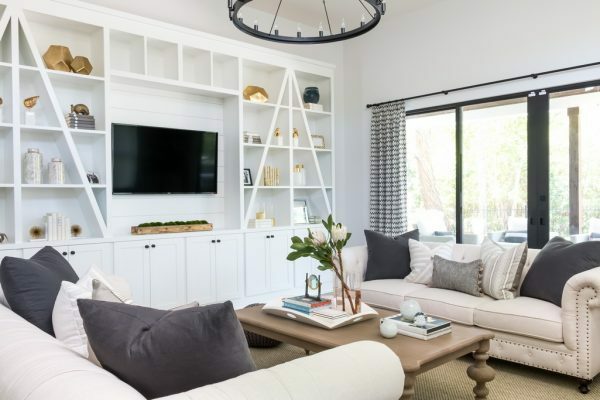 Media equipment is stored and hidden away in the lower cabinets and the upper shelves can proudly display a mix of gold, white, grey, and black accents. The built-in brings in a visual impact and practical storage space that our client needs. The custom built-ins are a harmonious blend of form and function. They also incorporate the old and new elements that define the modern farmhouse style. Our team can help you reimagine an ordinary space and transform it into your personal haven. Interested in learning more? Follow the link, fill out the questionnaire, and you will be one step closer to designing the home of your dreams!